Show up and unroll your mat! Yoga means to connect and to unite, and that’s what we are about here at The Falls Studio. It’s all about starting where you are, right now. It’s okay if you aren’t flexible, that’s the point! Saying you aren’t flexible enough for yoga, is like saying you’re too dirty for a shower! We all need yoga in our lives; it helps us open up. Mind, body, and spirit. The Falls Studio is 2,500 square feet, with bamboo flooring. All of our teachers are at least 200 hour Yoga Alliance certified, many with advanced certifications. We offer over 20 classes per week including Gentle, Power, Ashtanga, Kid, Hot, Heated, Candlelight, and Restorative classes. In many of our classes, the room is kept between 80-95 degrees to induce a gentle cleansing sweat. Other classes include Pilates and Ballet with a wall mounted barre. For a list of class descriptions please Click Here. We believe you will fall in love with yoga and everything The Falls offers! *Corporate Rates available for students, educators, health care workers, policemen, firemen, State of Texas and more businesses around Lubbock! Click Here to find out if we offer corporate discounts for you and your family. Show up and unroll your mat! 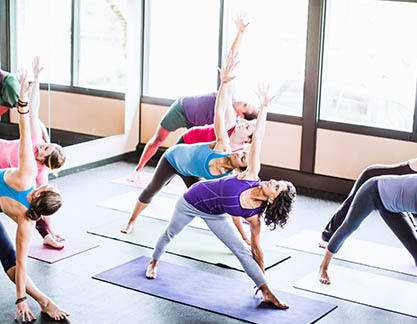 Yoga means to connect and to unite, and that’s what we are about here at The Falls Studio. It’s all about starting where you are, right now. It’s okay if you aren’t flexible, that’s the point! Saying you aren’t flexible enough for yoga, is like saying you’re too dirty for a shower! We all need yoga in our lives; it helps us open up. Mind, body, and spirit. The Falls Studio is 2,500 square feet, with bamboo flooring. All of our teachers are at least 200 hour Yoga Alliance certified, many with advanced certifications. We offer over 20 classes per week including Gentle, Power, Ashtanga, Kid, Hot, Heated, Candlelight, and Restorative classes. In many of our classes, the room is kept between 80-95 degrees to induce a gentle cleansing sweat. Other classes include Pilates and Ballet with a wall mounted barre. For a list of class descriptions please Click Here. We believe you will fall in love with yoga and everything The Falls offers!